Construction work on the terminal for new Muscat International Airport is going as per schedule and will be completed by the year-end, said a report, citing a senior minister. 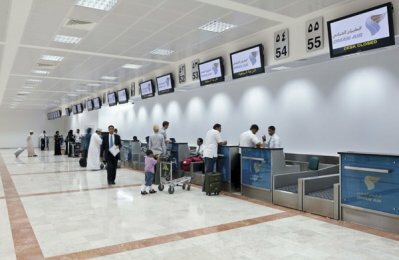 The Passenger Terminal Package (MC3 package) is 91 per cent complete and the ministry and the relevant authorities expect to receive the project from the contractor, and the operational readiness team will begin their process soon after, reported the Oman Observer, citing the Minister of Transport and Communications Dr Ahmed bin Mohammed bin Salim Al Futaisi. Speaking to the media during the airport site visit, the minister said the screening and training processes and checking the operational readiness will start soon after the completion of the construction of the passenger terminal. Work is also progressing well on the sultanate's other regional airports - Sohar, Duqm and Ras Al Hadd where the phase one and two have been completed, stated the report. The new airport aims to cater to around 12 million passengers every year, it added. On completion, the new airport will be able to receive the largest aircraft which are currently in service across the world, as the new runway is 4-km long and 75 metre wide. Passenger halls and on the airside (taxiways) have been designed in such a way that they can adjusted to the growing pace of travellers, said the report. A study is also being carried out to boost the capacity of the airport from 12 million passengers per year to over 20 million passengers and subsequently to 48 million passengers, it added.